The Rogue Grip Triangle is a versatile, standard-grip attachment featuring a pair of 7" (handle) long, 1.31" diameter handles. The Triangle’s compact design, quality knurling, and black powder coat finish make it a great option as a pull-up implement for a rig/rack, or as a go-to accessory for units like a Lat Pull down/Low Row. 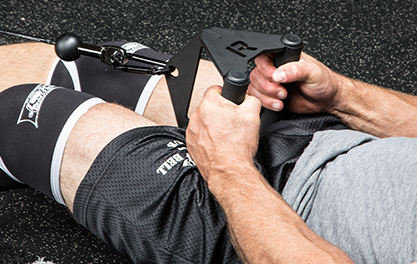 See Also: The Rogue Monster Grip Triangle - featuring wider 2” diameter handles for focused grip strength training. The Rogue Grip Triangle comes with a carabiner for easy, immediate set-up with a wide range of equipment. The entire attachment weighs just 5LB (carabiner included), and the handles are spaced in a close grip fashion, 6" on center. Possible uses for the Triangle include: Grip Accessory on a low row machine, Pull-Up Attachment for a rig/rack, Pulldown Row Implement on a lat pulldown machine, and connected to a loading pin (via carabiner) for standing bent over rows. Manufactured in Columbus, Ohio, the Grip Triangle’s knurled handles are constructed from 1” schedule 40 pipe, with side plates made from laser-cut 0.25" thick Steel Plates. 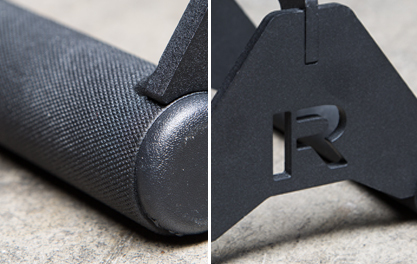 Along with our signature texture black powder coat finish, we’ve also included laser-cut Rogue “R” branding on each side of the attachment. This is a lightweight, non-abrasive grip tool that’s still built for high-rep, daily use. Rogue prides itself on fast, professional shipping, often with same-day turnaround times. 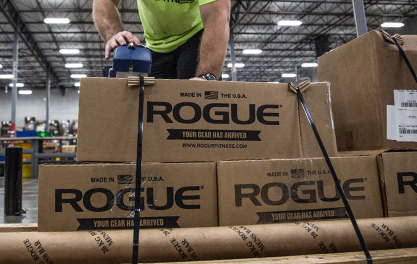 Your Grip Triangle(s) will be packaged safely and efficiently, and you’ll be able to follow the progress of your order from our factory floor to your door using the online Rogue Shipping Tracker. Rogue Grip Triangle (Standard Grip) is rated 4.7 out of 5 by 3. Rated 5 out of 5 by JW1776 from Outstanding product Found several options online, but whenever possible my default is to buy from Rogue, because I know it'll be a quality product and built like a tank. Glad I did. I have an old Lat Machine in my garage gym and wanted to upgrade the cheap Grip Triangle, and this product is perfect. Rated 5 out of 5 by OPEX Coach from So Good! Typical Rogue piece of gear, meaning black, overbuilt and bomb proof. Perfectly textured knurling as usual. Great purchase for us. Rated 4 out of 5 by Chris H from Rogue triangle grip Bought this to do close grip pulls. Works well for ,y purpose.